Most of those who visit Lauca come from Arica, Chile, "the city of eternal Spring" on the coast. 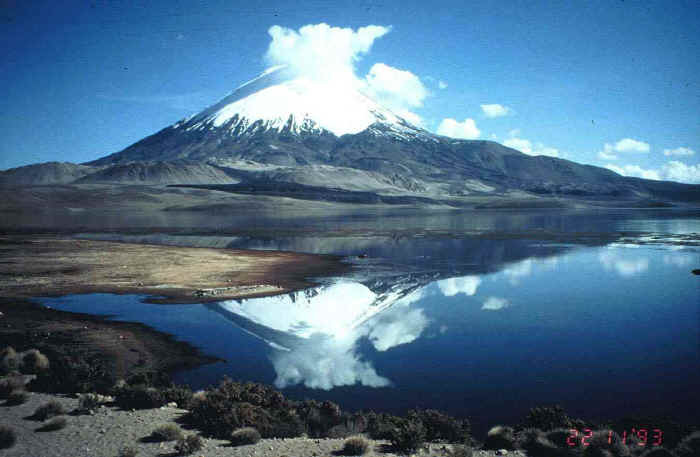 Lauca is at 4500 meters, however, and will reward those who come to it without proper acclimatization with a fine case of altitude sickness, the very least problem of which will be ferocious headaches. Lauca extends all the way to the Bolivian border at Tambo Quemado---itself at 4600 meters---and so those coming from Bolivia will not suffer from this illness. Since I came from Arica I stayed two nights at Putre (3500 meters), a town 20 kilometers or so from the park entrance, so that I could acclimatize. I did several day trips in the mountains nearby, one of which took me through a dramatic creek bed which led to a high plateau overlooking the town. To do this, walk to the right on the street where the Chilean carbineros have their building. You will be heading uphill of a dirt street that veers to your left (west) and goes around some houses which will soon be on your right. Follow the obvious trail and you will be in 30 minutes in the creek bed which winds to the north. After two days in Putre I loaded up my pack and headed north to the snow-capped mountains visible from the town. Walking north toward the Hotel Vicuña for about two minutes, I turned left at a stone cross and headed up a dirt and gravel path. In a few minutes it became wider and wound toward a green valley in the distance. After a while the path followed an irrigation canal that eventually led to the valley (4000 meters). This was a bit marshy but boasted fine views of Putre far below. I decided to camp. All was well until the sun went down. Simply put, the air became crystalline cold, a frozen torment that drove me into my tent. There was not much help there, as my year-long expedition was geared mainly toward jungles and terrain below 3500 meters. My tent and equipment was ill-suited to my environment. In the morning every water bottle I had filled the night before---except the one in the tent's vestibule---was frozen solid. As soon as the sun hit the campsite, all again was Heavenly. I headed up out of the valley toward those two mountains, and was surprised after an hour or so by---a road! This was a gravel affair that meandered west and east. I headed right (east) toward the modern highway that went from Arica through Putre and all the way through Lauca to the Bolivian border and on to La Paz. After one hour I came to the highway which also intersected the old road from Putre that joins the modern highway here. I chose the old road, but soon encountered what looked to be a short-cut leading into the valley toward Putre. I took it, but had to climb over a fence. Not five minutes later two Chilean army vehicles came rumbling up the trail and stopped right in front of me. Several very well-armed soldiers got out and surrounded me. It seems I was on Chilean army property. Oops. They took me to their headquarters---really just a large tin roof hut---and began to question me about why I had trespassed upon government land. My story did not make much sense to them until I asked if there was internet there. There was, and I asked them to pull up my website, http://mikeaustin.org . The soldiers got a good laugh from the photos there. After a few minutes, they took me back to the old road to Putre and sent me on my way. Wee. After an hour I was again in Putre. So: I will return to Lauca with equipment suited to its environment. This will have to wait until next year, however. I see this first trip as a reconnaissance, and so I have a plan. I will enter the park either from Arica or Bolivia and alight at Parinacota and camp (see the map). From there are trails that extend all through the park and around the stunning Chungara Lake. One can actually walk all the way on the altiplano (avoiding the highway through the park) to Las Cuevas near the park entrance toward Putre. This will take between five and eight days. 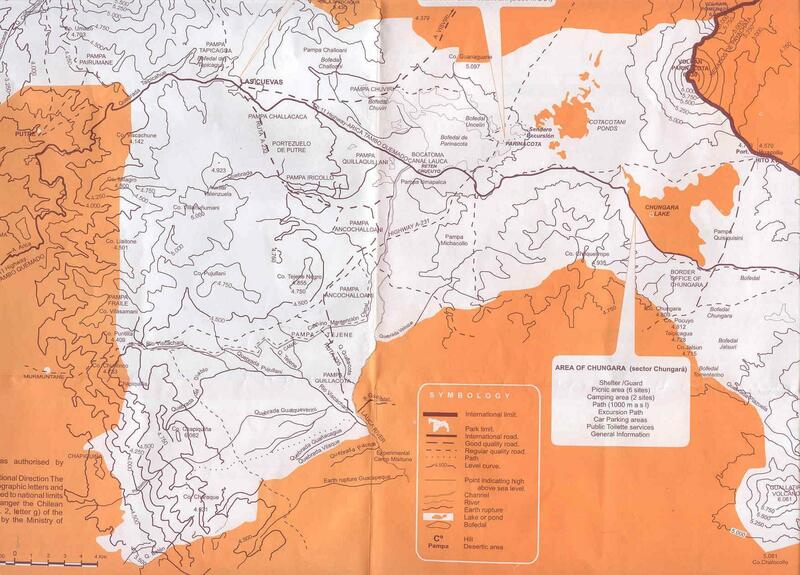 Once at Las Cuevas, I will grab a lift into Putre on the many trucks and buses that ply this route. Here is a photo---not my own---of Lake Chungara. Obviously, any backpacker who sees this will salivate and begin planning an expedition. (This will take a while to download.